Before taking a capital expenditure decision, take the best practice template, put it online, and have a streamlined execution process for your capital expenditure (CapEx) approval process: makes it transparent to the decision-makers and the task-owners. You can find a streamlined capital expenditure process and customizable capital expenditure forms in Comindware Tracker Finance and Administration solution. It’s ready-to-go and pre-configured for team work, and includes an automated workflow and collaborative features. The streamlined process has main steps for CapEx approval: request creation, rejection, clarification and verification, approvals. 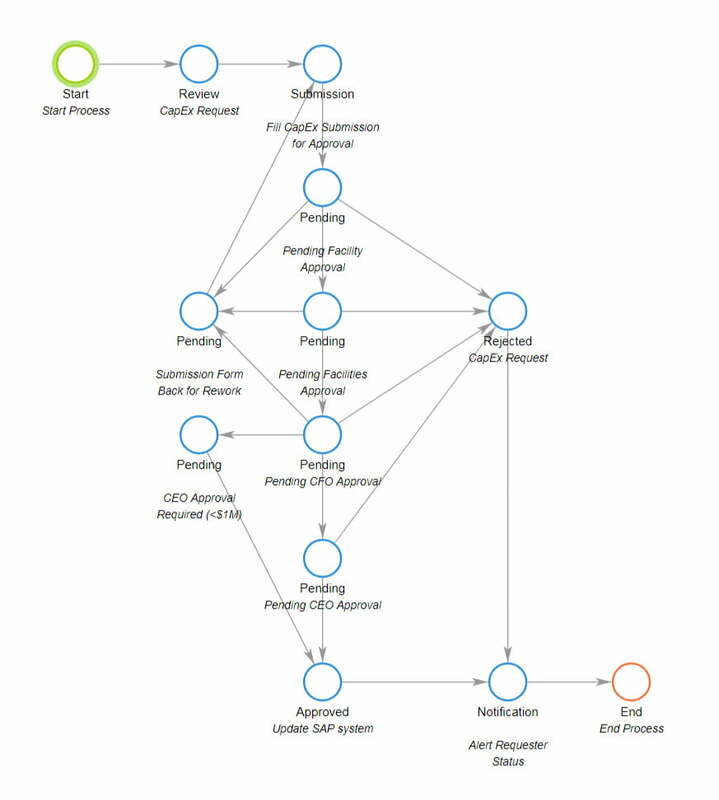 The advantage of the streamlined process is that the request won’t be able to proceed to a higher step before all of the review steps are completed, because the item isn’t moved manually down the workflow: Comindware Tracker moves it automatically and creates a task to the appropriate assignee along with sending an email notification to them. Note: Then it comes to expenses management, companies frequently consider streamlining both CapEx and OpEx management. Learn more about these 2 types of operating expenses in this article – “What is CapEx and OpEx”. An automated system doesn’t mean that your work becomes automated. You can discuss, accept, decline, or reject tasks and requests submitted via capital expenditure form. The communication thread for online discussion stimulates team collaboration, at the same time helping to reduce the number of emails and meetings necessary to get more detail in order for the decision to be taken. The additional benefits of the online process result in reduced paperwork and time saved on the process approval. With the Comindware Tracker Finance and Administration solution, you can see all of the capital expenditures in the form of configurable lists that give you an overall view of your investments, where each process has its status at the current moment. No need to make manual updates: while your team is working on the process, Comindware Tracker gets information from each task owner and keeps it in a single place. All the data is available online and stored either on your corporate server (if you chose the on-premise deployment) or in the Cloud (in case of the monthly SaaS subscription). Get our PDF Case Study to learn how Hertz has leveraged Comindware Tracker to create a modern CapEx approval application, which replaced complex Excel files and dramatically reduced the expenditure approval cycle time, decreased operational expenses and minimized financial risks. Your company has specific capital expenditure approval processes or CapEx requests that go beyond the norm – not a problem. Workflow software by Comindware allows non-technical users to configure customized CapEx forms and design your own workflows in drag and drop web-interface. Comindware Tracker ensures that your capital expenditure requests are handled properly and minimizes risks. Role-based access to the data makes it possible to share the information of the capital expenditure process only with those whom it might concern. In case other departments of your company use other Comindware Tracker Solutions, they will only have access to the data they need for work. At the same time you can share data across the application when the need arises. 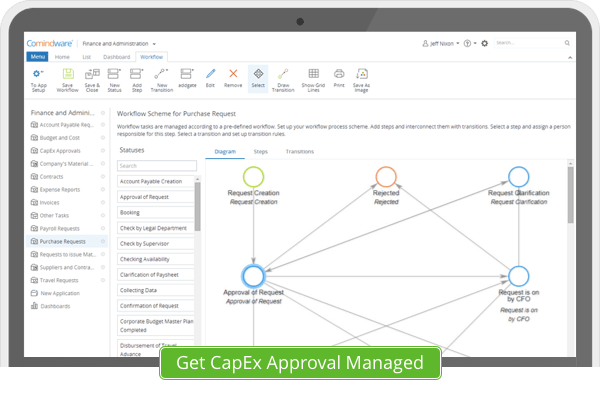 If you are still doubtful whether the online CapEx approval workflow process is easy to work with and will give you more visibility on assets acquisition and renovation, take an online tour or use a trial version of Comindware Tracker Finance and Administration Solution – that is more persuasive than any marketing can be.